The Taper convert this tape a few days after the show to CDR and unfortunaly he lost the original tapes,so the CDR copy is everything what he have from this great show. He never want to upload this tape from the “Secret gig” in Cologne,but “Never say Never”. The music is fantastic,a suprising setlist and the quality is very good,sometimes you can hear the crowd and some clapping from the people beneath me. The last song fades out and has some digi noise problems that I can not fix,so take it as it is. Chaos and anger about the distribution of tickets were the main issues weeks before the show took place at the very intimate E-Werk in Cologne. For the commmon customer it was almost impossible to get tickets at the box office. It was said only 1200 tickets were sold to the public for the only summer performance in Germany, which led to many offers at ebay. But those who paid up to 200 were not to go home dissapointed. ….After a look at the setlist of recent shows I didn’t expect a show like the one I had experienced in London, but a similar mixed set as he did at each show after his Meltdown performance. Many well known old songs, some pieces from “Low” and many great songs from “Heathen”. And with a little exception I was right. 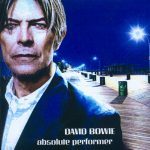 To the familar sound of Mike Garson’s piano, Bowie went slowly on stage wearing his black suit with blue leather tie to sing “Life on Mars?” beautifully as ever. What a magical moment. Bowie’s hair was throughout the show tousled by ventilators which was a very joyful view. His fantastic and loose mood was absolutely matched by the audience’s, who seemed to enjoy each and every moment of that concert. After “Slip away” Bowie started playing a funny childish melody on the stylophone in which Mike Garson joined in immediately. A moment that characterizes the show and Bowie’s general performance style this year. Open, loose and chatty. During a very lenghty band intro he asked Gerry Leonhard if he know the irish “dance like a river” (aka “Riverdance”) show. Yes he did and so he started to dance like Michael Flatley. Not that close to the original but another very funny moment. This show took place in a very small venue, only 2,500 people and it was sold out immediately. 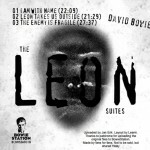 Bowie was smiling and laughing all the time, and during the encores he announced that the doors would be locked so that nobody could get out (and only unlocked after the performance of Low). 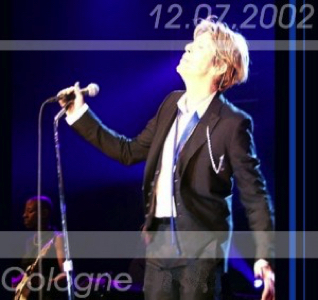 ….On 11th July Bowie was in Cologne in the ‘Harald-Schmidt-Show’. That’s the German late night show, and Bowie talked with Harald Schmidt (in English, and they broadcast it without any translation) and performed Everyone Says Hi live with the band. Interesting enough that they didn’t play Slow Burn which was the single at the time. 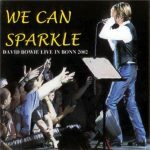 ….On 5th October Bowie is going to be on the ‘Wetten Dass’ Show in Kiel. Gerry Leonard – lead guitar. Mark Plati: rhythm guitar + bass. Gail Ann Dorsey – bass + guitar + vocals. Mike Garson – piano + keyboards.